Click on the cover for more information or to purchase a copy of Summons #2. The Summons series got off to a great start with its first issue. The story was captivating, the characters were interesting, and the artwork was top-notch. The issue number one ended on a high note, and issue number two fully capitalized on the built up momentum. Its good to see that Chris Williams and the creative team didn’t slack off with issue number two. The story picks up where the last issue left off, and we are introduced to Jon Feral, aka the Black Fang. He is a detective by day, and (due to a curse) a werewolf by night. There are two powerful factions that appear to be competing for his allegiance, including a pack of fellow werewolves, who see him as their liberator, and their mystical enslavers, who have their own plans for the Black Fang. 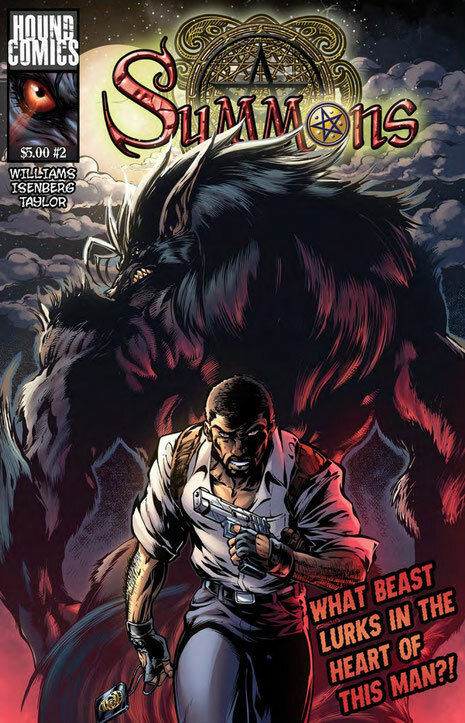 While you won’t see his werewolf form in action in this issue, you will get to see a day in the life of Detective Feral, which provides great insight into the man behind the monster. A man, like many others, currently struggling to maintain the proper balance between his personal life and professional career. Feral also has ties to Kristine Helios’ adoptive family, which will undoubtedly allow the two to cross paths in the near future. Chris Williams did a great job of introducing this character, who figures to play a major role upcoming events. This issue is big on story, but a little light on action. There is a scene where Kristine gets to exhibit a portion of her powers, and gets into a minor scuffle at school, but no major battles. This is not necessarily a bad thing, since it allowed for some great story telling and character development. More plot details are revealed, some other key players were introduced, and readers received further insight into Kristine’s background, personality, family and personal life. The artwork in this issue is actually improved over the impressive visuals of the first issue. The panels contain more detail, the lines are cleaner, and and the colors pop more. If the visual trend continues, I can wait to see what issue three looks like. The artwork alone is probably incentive to pick up a copy of this comic book, but many will find the story just as appealing, or more so. +Great Story, Very Good Character Development, Great Artwork, & Black Fang!